The nomadic tribe or Banjara are believed to have descended from the gypsies of Europe thousand of years ago and settled in the deserts of Rajasthan. They are among the most colourful tribe in India because of their dresses and jewelry. This nomadic group practises the craft of Banjara tribal embroidery and mirror work. They make beautiful fabric which is characterized by vibrant colours, ornate embroidery and mirror work. 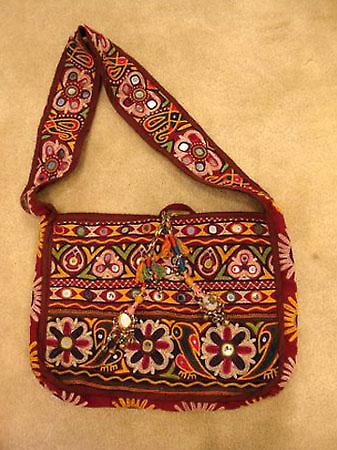 Products made by banjara embroidery includes bags, belts, purses, cushion and pillow covers, bed spread, quilts apart from salwar suits, skirts, blouses etc. The embroidery sometimes also uses silver, brass, cowries, animal bones and gold.